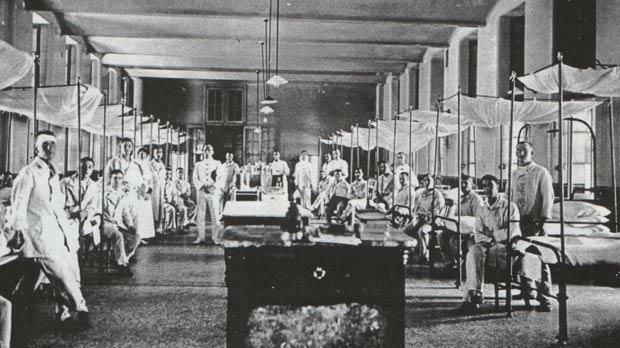 Patients at Bighi Naval Hospital. 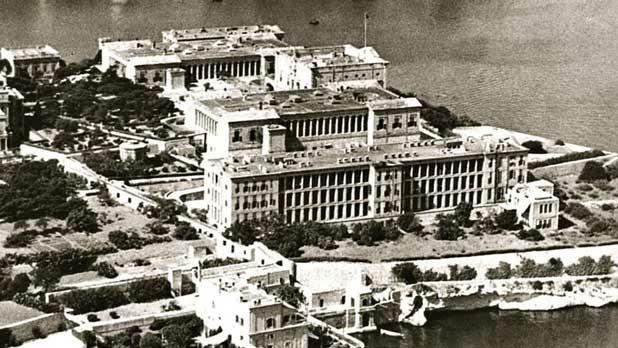 An aerial view of Bighi Hospital, which is now Heritage Malta’s head office and conservation centre. An overhead view of Anzac cove in June 1915. In the wake of the Dardanelles campaign, preparations began for large-scale troop landings on the Gallipoli peninsula. After the initial landing, the Allies were able to make little progress from their landing sites as the Turks gathered more and more troops on the peninsula from both the Palestine and Caucasus fronts. The Allies suffered huge casualties during the campaign, and thousands of wounded troops were brought to Malta for treatment. It was during this period that the island earned the nickname ‘Nurse of the Mediterranean’. The design for the assault on the Gallipoli peninsula had drifted in complexity since early January 1915. There were clashes of personality in the War Council; Secretary of State for War, Lord Kitchener, was reluctant to release trained troops, except for service in France, and the eventual calling upon the inexperienced Vice-Admiral Carden to formulate the plan for the unassisted bombardment of the fortifications of the peninsula. During the Gallipoli campaign, submarines were used to penetrate the Dardanelles Narrow and the Sea of Marmara to sink enemy ships. The naval attack was planned as an unassisted bombardment in which the assaulting ships would simply reduce the Dardanelles defences to smoking ruins and then sail on triumphantly through the Narrows to the Sea of Marmara. But it was not a surprise that the naval assault of March 18, 1915, failed. Confusion was intensified after Lord Kitchener reversed his earlier refusal and agreed to send 70,000 troops to the Aegean. He gave command of Mediterranean Expeditionary Force to General Sir Ian Hamilton. It consisted of the experienced British 29th division under the command of Sir Aylmer Hunter-Weston. Among the British Empire forces were the men of the Australian Imperial Force (AIF) and the New Zealand Expeditionary Force (NZEF) who had been training in Egypt. They were combined into one army corps, known as the Australian and New Zealand Army Corps (Anzac) under the command of Sir William Birdwood, the Royal Naval division under the command of General Archibald Paris, and the French Near East Expeditionary Corps Expeditionary Corps, consisting of a motley collection of foreign legionaries and Zouaves under the command of General Albert d’Amade. Hamilton was given his command on March12. Up to that day he had been general officer commanding the central force in England. Hamilton and his staff arrived in the Aegean on the cruiser HMS Phaeton and established his headquarters on the liner Franconia. From there, on March 22, he went across to de Robeck’s flagship HMS Queen Elizabeth and with de Robeck decided that only an attack with combined naval and military forces could be successful in capturing the Gallipoli peninsula and commanding the Dardanelles. 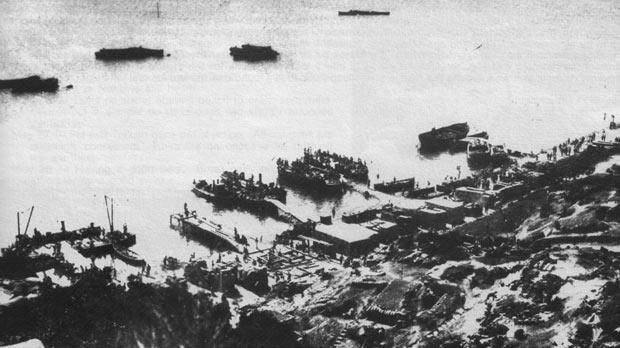 Hamilton prepared for two landings: the 29th division would land at Cape Helles on five small beaches designated: S, V, W, X and Y. 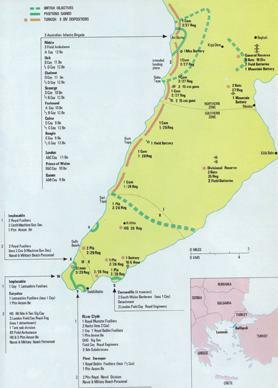 The Anzacs would land further north on a jutting promontory called Gaba Tepe (designated as Z beach). The French Corps would launch a feint landing at Besika Bay. Afterwards, the French were to make a proper landing on the Asiatic coast at Kum Kale. It is generally assumed that one major failing of the Allied forces in the Dardanelles was that they underestimated the ability of the Turks. In fact, the Turkish army was weak in the region and it was poorly led. On March 24, the command of the Turks was passed to the German General Liman von Sanders. He had to defend a coastline of 150 miles with just 84,000 men. However, its fighting capacity was just 62,000 men. He placed his men away from the beaches, much to the consternation of the Turkish officers there. On April 25, an Allied fleet consisting of 18 battleships and 12 cruisers started disembarking the first 30,000 troops at Gallipoli. The Anzacs landed at Ari Burnu, instead of Gaba Tepe, which was further north than intended, and instead of an open beach they were faced with steep cliffs and ridges. Soon Ari Burnu became known as Anzac Cove. To make matter worse, Anzac Cove was a tiny beach and quickly became very congested. The Turks pushed back the initial Anzac move inland. The fighting was bloody and costly. 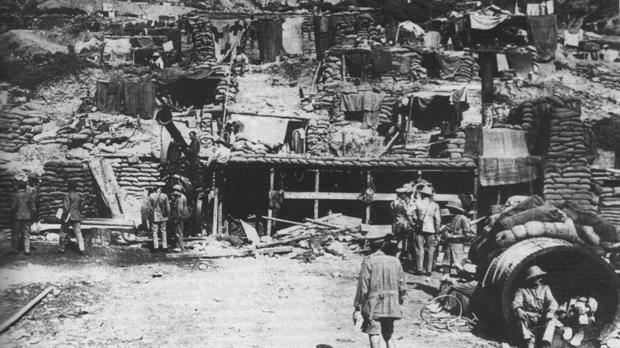 The Anzacs were stopped by a Turkish division commanded by Mustapha Kemal (later Kemal Atatürk, the father of modern Turkey). That same morning, around Cape Helles, the British landed at a number of different locations. Their objective was the high point of a plateau about 11 kilometres from the cape, which ran across the peninsula, known as Achi Baba to the British, and then to progress north from there to join up with the Anzacs. Across the Straits, the French mounted a diversionary landing at Kum Kale. The British position in the south became known as Helles. But strong and unexpected Turkish resistance held off both these attacks, and by the evening of April 25 the landing forces clung to small gains at both Anzac and Helles. Over the next few days, during the Battle of the Landing, and despite terrible casualties on both sides, the Turks were unable to drive the Anzacs back into the sea. By May 5, they were left holding a part of Turkey. During May and June the British undertook a number of operations at Helles, designed to push their line towards Achi Baba and hopefully to break out to the north. All of these actions – the First Battle of Krithia, fought on April 28, the Second Battle of Krithia, fought on May 8, and the Third Battle of Krithia, fought on June 4 – failed to achieve their aim. On May 19, the Turks mounted a major attack all along the ridge, but were shot down in their hundreds by rifle and machinegun fire as they charged across the narrow ridge. By May, in Helles, the British had lost 20,000 men out of 70,000. Medical facilities were completely overwhelm­ed by the casualties. Trench warfare occurred along with the fear of dysentery and the impact of the heat. During the campaign, the Royal Navy continued to provide support to the army by bombarding Turkish positions. However, in May, three battleships were torpedoed. HMS Goliath was sunk by the Ottoman torpedo boat Muâvenet-i Millîye in Morto Bay on May 12, HMS Triumph off Anzac on May 25, while HMS Majestic off W beach on May 27; the latter two warships were sunk by the German submarine U-21. On the other hand, by the end of the Gallipoli campaign in January 1916, 13 Allied submarines took part in the Dardanelles operations, and although eight were lost, 27 successful passages were recorded. Turkish losses included two battleships, a destroyer, five gunboats, 11 transports, 44 steamers, and 148 sailing boats. Both John A. Mizzi in his book Gallipoli: The Malta Connection and the Royal Army Medical Corps (RAMC) Malta website tackle in detail Malta’s role in the Gallipoli campaign. 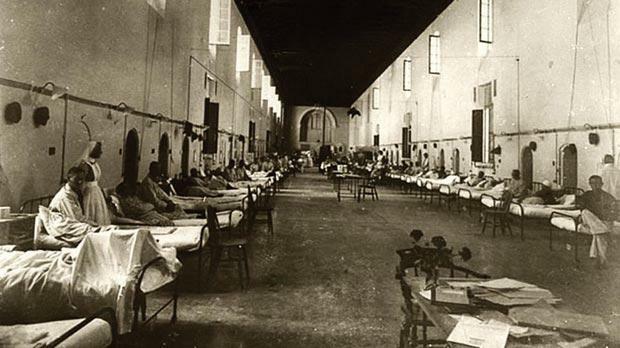 In 1914, Malta had four military hospitals – the Military Hospital in Cottonera with 167 beds, Mtarfa Barracks Hospital with 55 beds, St Julian’s Forrest Hospital with 20 beds, used mainly for venereal diseases, Valletta Station with 26 beds, and Military Families Hospital. There was also a small military hospital at Fort Chambray in Gozo and the Royal Naval Hospital at Bighi. The establishment of the RAMC in Malta before the outbreak of the war in 1914 was 23 officers, 150 other ranks and 12 nursing sisters of the Queen Alexandra Imperial Military Nursing Service. On the declaration of war, the majority of regular RAMC officers were withdrawn from Malta for active service elsewhere, and replaced by four RAMC Territorial Force (TF) officers, four officers and nearly 200 men of the 1st (City of London) Field Ambulance TF. In February 1915, the general officer commanding in Egypt was offered 500 beds for any wounded as the Gallipoli campaign appeared imminent. But the authorities in Egypt replied that these would not be required. Governor Lord Methuen (February 16, 1915 - April 1919), foreseeing heavy casualties, ordered the expansion of existing hospitals and selection of buildings for hospitals. A scheme was drawn up to extend the number of beds to 2,000 in Malta, with 500 beds for convalescents at Fort Chambray. The first batch of wounded in the naval operations arrived in Malta on March 20, 1915. On April 9, Malta was asked to prepare, in case of necessity, for 3,000 wounded. The first casualties from the Gallipoli campaign consisted of 600 cases that arrived in Malta on May 4. Barges of wounded men were gently unloaded on to the quayside outside Valletta’s ancient Sacra Infermeria Hospital. From here the wounded were sorted and moved on to the other hospitals around the island. Local Boy Scouts ran errands for the soldiers, posting their letters and bringing them magazines. There was a cool garden at the back of the hospital where a weekly concert was held for the patients. More wounded soldiers arrived during the next days; 500 on May 5, and 640 on May 6. By the end of the month over 4,000 sick and wounded had arrived. The nuns of the Little Company of Mary, the ‘Blue Sisters’, offered their hospital at St Julian’s, comprising the nursing home Casa Leone XIII and adjoining Zammit Clapp hospital. Marchesa Scicluna lent Villa Dragonara as a convalescent home and provided £100 a month for its upkeep. Australia Hall was quickly constructed near the hospitals at St Andrews, capable of accommodating 2,000 people. An additional 39 nurses arrived on May 7. A total of 240 medical officers, 567 sisters and voluntary aid detachments (VADs), as well as 1,760 men of the RAMC attended the sick and injured. The first badly-wounded soldiers, who reached Malta on May 4, were brought on HT Clan McGillivray. Of these, 160 severe cases were admitted to Valletta; the remainder went to Tigné to be treated as convalescents. The HT Clan McGillivray was moored in Sliema Creek and the slight cases were taken to Tigné, while the rest were taken off in lighters to Pietà. They were then moved by ambulance wagons and motor cars to Valletta Hospital. There was no end to the number of casualties arriving in Malta. On May 5, 394 military wounded arrived on the HS Sicilia. Two hundred of these were sent by lighter to Cottonera Hospital, the remainder to the Royal Naval Hospital in Bighi. Another 30 wounded disembarked from the Somali Ambulance. On May 12, about 700 cases arrived in the HT Caledonia, bringing the total number of sick and wounded in the island to 2,593. The sick and injured were disembarked at Marsam­­­­xett Harbour. The minor cases were sent to St George’s and the cot cases to St Andrew’s. On May 17, HS Soudan proceeded to Gaba Tepe to receive 314 wounded from the Anzac contingent. On May 21, HS Soudan left the Dardanelles for Malta. It arrived on May 24 and disembarked 85 non-commissioned officers (NCOs) and men, who were sent to Cottonera Hospital, seven officers to St Andrew’s Hospital, and 128 cot cases to Valletta Hospital. On May 17, 773 wounded arrived from Egypt on the HT Braemar Castle and were sent mostly to Mtarfa and St Andrew’s hospitals. On May 18, the Royal George brought 353 cases; the Southlands brought another 776 cases, all from Egypt. By June 1915, there were 14 hospitals in Malta, served by 117 medical officers, 300 nurses and 753 ranks. Between June and July the number of beds rose to 13,093, dealing also with new ailments, dysentery and enteric fever. At the same time that preparations were made for the landings at Gallipoli, the first British-Australian HMAS AE2 succeed in passing through the Dardanelles Strait on the night of April 24-25. HMAS AE2 attacked the Turkish light cruiser Plykisrvket, but it did not sink. 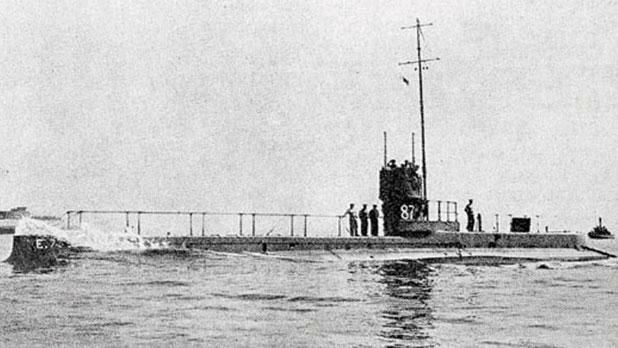 The submarine’s luck finally ran out in Artaki Bay near Panderma, when on April 29, she was attacked and sunk by the Turkish torpedo boat Sultanhisar. The crew abandoned it as it settled and they became prisoners-of-war. The second submarine through the straits had more luck than HMAS AE2. 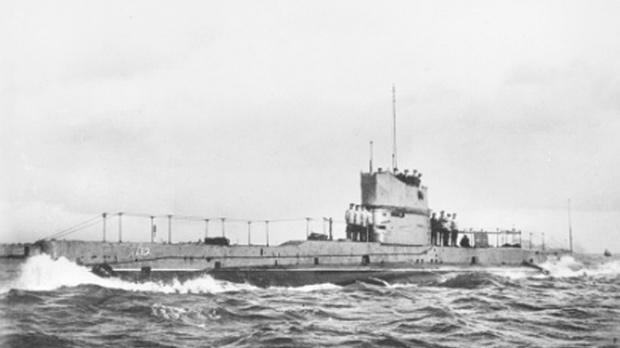 On April 27, HMS E14, entered the Sea of Marmara, where, in a three-week campaign, the submarine sank a gunboat and a minelayer and several thousand tons of assorted small steamers. On May 10, HMS E-14 sunk Gul Djemal, which was carrying 6,000 troops and a battery of artillery. Perhaps the most successful British submarine commander in the Great War was Lieutenant-Commander Martin Nasmith, commander of HMS E11. It had also a successful cruise in the Sea of Marmara. Nasmith captured a trading schooner; on May 23 he sank a gunboat and a minelayer; and on May 24 near the port of Tekirdag he attacked and sank an ammunition ship. Nasmith achieved his most spectacular feat early on May 25, when he entered the harbour of Constantinople itself and succeeded in sinking the large troop transport Stamboul at Arsenal Quay just outside the Golden Horn. Before exiting the Dardanelles, on June 6, Nasmith sank another large transport above the Narrows. In June, E-7 made her way through the Dardanelles. It was attacked by a shore-based torpedo crew and a destroyer made two attempts to ram it. However, it managed to come through unscathed. On June 30, HMS E7 relieved HMS E14. While it started a 24-day patrol in the Sea of Marmara it succeeded in bombarding the Zeitum Powder Mills in Constantinople. The submarine’s small Hotchkiss six-pounder deck gun could do little actual damage, but the psychological impact of the attack was great. HMS E7 succeeded also in sinking 13 ships and damaging many more.